Story: For some unknown reason Hotwire believed that Aric had killed someone named Kenny (possibly Ken Clarkson), and now he wanted revenge. Apparently he wanted to be a hero and participated in some experiments, which gave him his electrical powers . 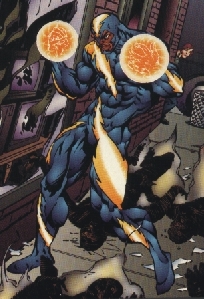 Skills & abilities: Electrical powers allowing him flight and electrical discharges.